"I am something terrifying, neither man nor animal, a thing more hammered and more deformed than any stone gargoyle." Quasimodo. The Monster and the Magician, a rare 1826 French play by master fantasist Charles Nodier (with Antoine Beraud and Jean Toussaint Merle) revisits the legend of Frankenstein, recasting the legendary scientist as a sorcerer and his Monster as a mute killer from Hell. 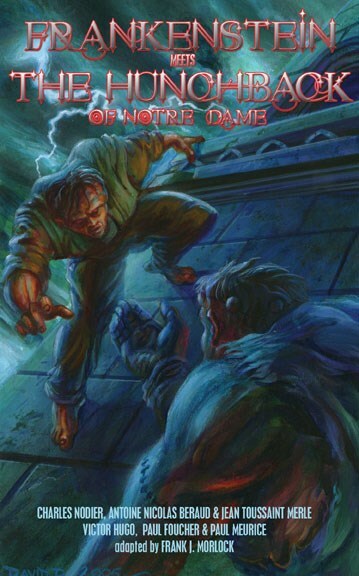 The Hunchback of Notre-Dame was adapted by Paul Foucher and Paul Meurice and rewritten by Victor Hugo himself into a stage play that throws new light on the classic tragedy. These two never-before-translated masterpieces are supplemented by The Passion of Frankenstein, an all-new story by translator Frank J. Morlock (Lord Ruthven), in which the Frankenstein Monster travels back in time to save Quasimodo, but does not count on the intervention of - Dracula! Three tales featuring the two most tragic monsters in the history of Gothic literature, plus introductions by Frank J. Morlock.